Top 5 update changes for Naarden Commanders. Or how the 1.5 mega update affects Naarden matches. 1) What is the Spy Report? Aka: The exquisitely satisfying report. Last round I took out a French leader unit and shot the French Commanders SF mortar with my siege cannon. Now each round, both players can see the current morale and man count of each others persistent units. These units are the core of the campaign and are more important than even the battle objectives. The units are all shown here. Hidden units show up as partially see through. The ‘Spy Report’ is just what you see here. It is visual. You see the elite unit count, man count and morale. It’s a ‘Spy Report’ because you always have this info even for hidden enemy units. The coloured pies above are not part of the report (shown here just to show you ‘where’ the spy report is). I recommend not hitting the ‘Take Turn’ or ‘Next’ button so quickly any more. 2) Elite, persistent SF units are now visually different. Forget the battle win record. Who ever has the most of these units when they hit the city is the stronger Commander. They have a grey morale bar now. It persists even in negative morale so you can always identify the important units that that die dramatically and reduce all frontal melee attack damage by 1. 3) Rule Changes to note. • Siege Cannons can now move into an enemy ZOC and fire or use grape shot. • Cavalry can now damage Buildings. Especially useful with leaders. • Muskets no longer do double damage to locked units and do partial damage when partially blocked. • Ballistic Artillery damage was toned down (splash damage is half). • Size is no longer limited when it comes to morale hits. Size one units can cause morale hits same as any unit now. • Breakaways now end your movement instantly. Chose that one destination wisely. • The new Rally (strong formation of 3) will now remove negative morale and give the 3 units +1 melee. • LOS now sticks. Meaning you can peak around the corner and move back. The area will remain viewable for a bit. 4) Major battle Changes to note. • The Breech: Extra cavalry unit. • The Wheat fields: More Calvary, less Muskets. • Cannon Showdown: No more waypoints on the top. Just a cannon showdown now. • Winter Keep: The light trees in the middle. • The Naarden city battle: Keep in mind ballistic artillery is now weaker. • Removes all those beginning of round Naarden dialogs and popups. • Keeps you in full screen mode. • Stops the top bar units from flashing the TAP ME. Oops! 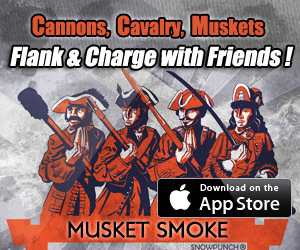 Musket Smoke 1.51 submitted to the App store. There were a few issues with the mega 1.5 update. I swear we tested for weeks, but we also kept adding more features. The side effect of that is usually more bugs. Finally 1.5 really seemed stable but a few of our ‘heavy duty’ live players found some things that needed some attention. So probably a week. Then we will be all good. In the meantime I recommend to avoid using the ‘launch match from lockscreen’ feature. 22 things I like about the 1.5 Mega update! 1) The Naarden Spy Report. 2) A freaking awesome Manual. 4) Preview damage with live context info in the top bar. 5) Social features: ELO like Leaderboards, name ranking (achievements), stars & hearts plus a larger chat window. 7) The new Mini Match Leader matches. 8) The next button (you will know when you see it). 9) The Mini Match TRUCE button (a white flag option). 10) New app POLISH and stability. Nice loader and map name display. 11) The lost connection auto recovery system. PLAY, WAIT, re-SEND. 13) FULL SCREEN. Plus top bar buttons no longer hangs over the map. 14) The 2 new Mini Match maps (for full multiplayer). 15) GREEN STAR – lets you know who can create special matches for you. 16) Naarden scenario or map adjustments. 17) Mini Match random start sides. 19) App stability, bug fixes, gameplay ui and memory improvements. 20) The top 7 Mini Match players and the top 7 Naarden Commanders on the Start page. These legendary players will become household names as they will be on everyones start page. Woe to he who randomly falls upon their war paths! 21) The chat preview notification. You can tap on the left of the game list item or it runs automatically when you start a match.